Navigate to the Module Manager and press the "Administrator" link. To create a new Module, press the "New" button on the toolbar. To edit an existing Module, click on the Module Name or click on the Module's checkbox and press the Edit button on the toolbar. 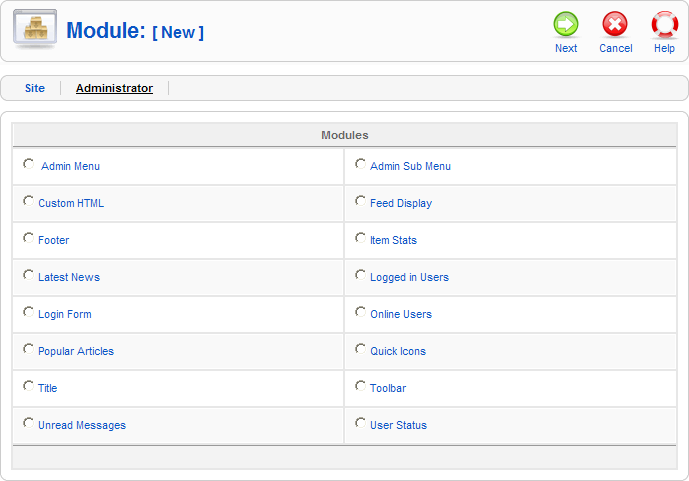 This is where you will add new Modules or edit existing Modules for the back end of your Joomla! web site. 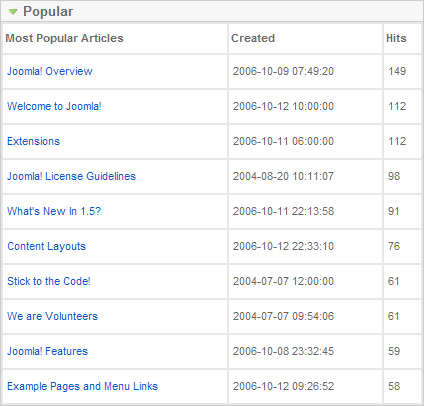 When you install Joomla!, 16 built-in Modules are available for use in the back end of your web site. Note that if you install one or more Joomla! Extensions, these Extensions may add new Administrator Module Types. In this case, your screen will show additional Types. 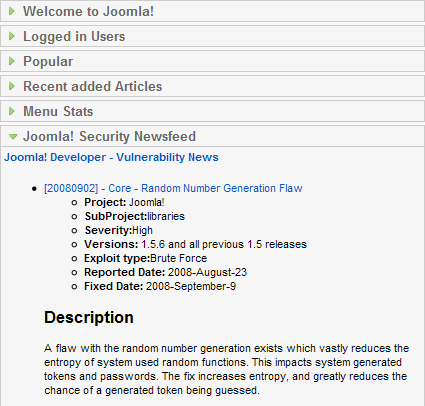 A standard Joomla! installation includes 16 Module Types. Each has it's own function and it's own Parameters, as described below. The Type for this Module is "mod_menu". It has no Module Parameters. This Module shows the submenu navigation Module. This is used in the Banner, Contacts, News Feeds, Web Links, and Module Managers to allow navigation to the different element types (for example, Banners, Clients, and Categories). An example of this Module is shown below. The Type for this Module is "mod_submenu". It has one Module Parameter called "Caching", which is always set to Never. The Type for this Module is "mod_custom". This Module is the same as the Custom HTML Module under Modules Site. This Module is the same as the Feed Display Module under Modules Site. This Module is the same as the Footer Module under Modules Site. The Type for this Module is "mod_stats". This Module is the same as the Latest News Module under Modules Site. The Type for this Module is "mod_logged". This Module has one Module Parameter called Caching, which is always set to Never. This Module displays a Username and Password Login form. It cannot be disabled. The Module Type name for this is "mod_login". Caching. Always set to Never. Encrypt Login Form. Whether or not to encrypt the login data. 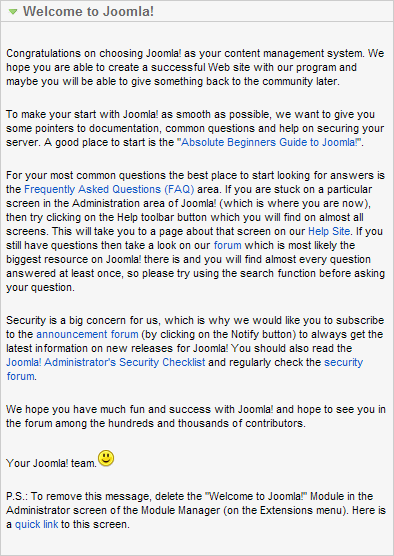 This requires SSL and should not be set to "Yes" unless Joomla! is accessible using the "https://" protocol prefix. 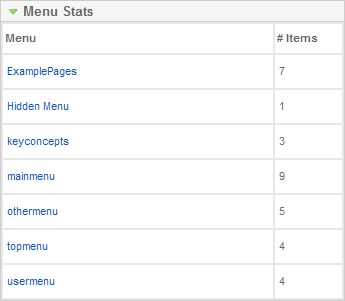 This Module shows a count of users currently logged into the Joomla! back end. The Module Type name for this Module is "mod_online". It has one Module Parameter called "Caching", which is always set to Never. The Type for this Module is "mod_popular". It has one Module Parameter called "Caching", which is always set to Never. The Module Type name for this Module is "mod_title". It has a Module Parameter called "Caching", which is always set to Never. The Module Type name for this Module is "mod_toolbar". It has one Module Parameter called "Caching", which is always set to Never. This Module displays the number of unread Private Messages and provides a button to navigate to the Tools → Read Messages screen. The Module Type name for this Module is "mod_unread". It has one Module Parameter called "Caching", which is always set to Never. This Module shows the User Status icons. This includes a Preview button, a Logout button, and counts of Private Messages and current Users. An example is shown below. The Module Type name for this Module is "mod_status". It has one Module Parameter called "Caching", which is always set to Never. 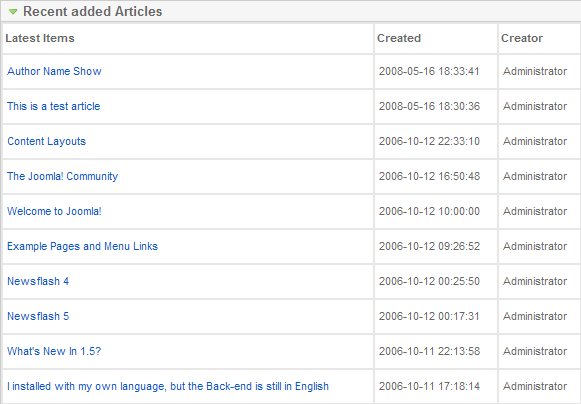 This page was last modified on 30 May 2010, at 08:49.